They represent a small fraction of fluorochemical production, but are a major part of the contamination problem because they get discharged directly into the environment, says Jennifer Field, an environmental chemist at Oregon State University in Corvallis, who collaborates with Higgins. And with the Northwest Forest Plan’s focus on preserving old growth forests, biologist Matt Betts of Oregon State University expected bird populations to increase accordingly. But the data showed we’re still losing old growth on federal land – as well as the birds. A proposal to transfer ownership of the Elliott State Forest from the state to Oregon State University is taking a small step forward today. Shanaka Silva, an Oregon State University geologists and study co-author, argued previous super eruption models focused on super-sizing smaller eruptions. He said: “Instead of taking the evidence in these eruptions at face value, most models have simply taken small historic eruptions and tried to scale the process up to super-volcanic proportions. "You can't replace sleep with mindfulness exercises but they might help compensate and provide a degree of relief," said lead researcher, Charles Murnieks, Assistant Professor from the Oregon State University in the U.S.
Like the Chelan, Cheery Grand is an early June cherry, but unlike the Chelan, it is much larger, says Lynn Long, Oregon State University Extension specialist emeritus in The Dalles. Snow day! Many were hoping against hope for at least one snow day this winter, and Tuesday we got our wish. While it was only a two-hour delay, there was plenty of time to build snowmen, make snow angels or just walk around campus enjoying the beauty. While there's still a slight chance of snow on Thursday, Wednesday looks sunny. Rummage Sale EESC will host a rummage sale in the fourth-floor foyer of Kerr from 8 a.m. to 5 p.m. Feb. 4-8 to support the annual food drive. Peruse housewares, books, movies, toys, clothing, and more. For questions, contact Noelle.Mills@oregonstate.edu. This event is part of the OSU Food Drive. PB&J Bar - Choose from a variety of jelly, jam, butters and honey to make your PB&J. Feb 4-8 stop by Gilmore Hall 116 from 8 a.m. to 5 p.m. to make your sandwich. Thanks to New Morning Bakery for their generous donation. Suggested donation of $1-5 based on what you can afford. FMI email jennifer.cohen@oregonstate.edu. This event is part of the OSU Food Drive. 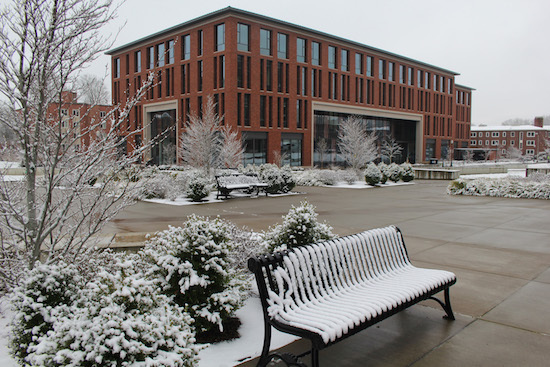 Department Only Surplus Sale: Surplus Property will host a sale of furniture and lab equipment to OSU departments only on Wednesday, Feb. 6, and Thursday, Feb. 7, from 9 a.m. to 3 p.m. each day at 4575 S.W. Research Way. Merchandise photos, more sale details and contact info here. Soup Lunch: The soup will be $3 for one bowl or $5 for all you can eat. Feb. 6, noon - 1 p.m. in 240 Strand Agricultural Hall. For more information contact Jessica.Fitzmorris@oregonstate.edu. This event is part of the OSU Food Drive. Bioinformatics Users Group (BUG): “An introduction to applied graph databases using Neo4j and Cypher, i.e., As true in database design as it is in life: Prioritize your relationships.” Justin Preece (Jaiswal Lab, Botany & Plant Pathology), Wednesday, Feb. 6, at noon in ALS 3005. BUG consists of life scientists, bioinformaticians, computer scientists, mathematicians, engineers, statisticians, and researchers of all types who meet to discuss topics related to these fields of study. All are welcome. For additional information, see https://cgrb.oregonstate.edu/bug. EECB Seminar: Felisa Smith, professor at the University of New Mexico, will present a seminar, “The Influence of Hominins on Mammal Biodiversity and Body Size Over the Late Quaternary” on Wednesday, Feb. 6, 3 p.m., in Withycombe 109. The seminar is free and open to the public. For more information go to http://ib.oregonstate.edu/smnrs. NEW! OSU International Scholar and Faculty Coffee Social: OSU Folk Club, Crossroads International and OSU Office of International Services would like to invite you to join international visiting faculty, scholars, students and their families for conversation, coffee, tea and light snacks at the Corvallis Multicultural Literacy Center (CMLC) in the Einerson House (EINH), 2638 N.W. Jackson Ave, Corvallis. on Friday, Feb. 8, from 10:30 a.m. to noon. NEW! The North American Truffling Society Meeting and Potluck: Our annual potluck begins Feb. 9 at 6 p.m. at the Corvallis Senior Center, 2601 N.W. Tyler St., Corvallis. Bring a dish to share (if possible, provide a list of ingredients for those on restricted diets), tableware, and the beverage of your choice. NATS provides coffee and tea. The speaker will be Amy Rossman, who will present her jungle experience in "Collecting fungi in the Amazonian Cerra de la Neblina, Venezuela." OPEnS House: The Openly Published Environmental Sensing (OPEnS) Lab (open-sensing.org) invites everyone to the second annual OPEnS House on Feb. 7 from 3-5 p.m. in Gilmore Annex 200. Come learn about the OPEnS Lab equipment, capabilities, and projects. There will be a 10-minute presentation at 3:45 pm. Refreshments will be provided. Documentary on Ruth Bader Ginsberg: Come join the Center for Civic Engagement and Hattie Redmond Women & Gender center on Feb. 7, 6 p.m., in the MU Lounge for a free documentary showing on Ruth Bader Ginsburg. Light refreshments will be offered and there will be a small discussion section before and after the movie, led by Rorie Solberg from the political science department. BEavers HERE NOW Drop-In Meditation: Mondays – Fridays, weeks 2-10 at 1 p.m.,, in the Craft Center. No experience necessary. All are welcome. Enjoy a different 15-minute guided meditation each week. Benefits of mediation include: Stress reduction, better sleep, sharper concentration, anxiety management and happier relationships. Contact tess.websterhenry@oregonstate.edu to coordinate extra credit for student attendance. Faculty and staff are welcome too. Stay after meditation for a mindful art activity hosted by the Craft Center. NEW! Top Hat Faculty Panel: Panel on how OSU instructors are using the Top Hat student response system for active learning, and how they are managing personal devices in the classroom. Questions and healthy skepticism are invited. Friday Feb. 8, 11 a.m. to 12:20 p.m. in Kidder 202. Refreshments will be served. The session will be available via Webex and will be recorded. Register here. Questions? lynn.greenough@oregonstate.edu. NEW! Budget conversation: On Friday, Feb. 8, at noon the Office of Budget & Fiscal Planning will hold another University Budget Conversation in the Memorial Union 208. This week’s topic is about the FY19 budget reductions and FY20 outlook. The budget conversations sessions are limited to 60 minutes and are an open forum structure with the initial 15-20 minutes spent on presentation of the topic, leaving time for discussion and Q&A. We encourage you to bring your lunch and join the conversation and to learn more about OSU’s budgeting and fiscal matters. A budget brief (handout) will be available on Friday. More information about University Budget Conversations can be found on the Office of Budget & Fiscal Planning website. If you have questions, contact Sherm Bloomer for more information. For details on attending the meeting via conference call contact Kayla Campbell . NEW! Wikipedia Editathon: “Writing African American History into Wikipedia.” No experience necessary. Organizers give you everything you need to help add to the historical record in Wikipedia: topics, information and a Wikipedia account. Register now and find out more at tinyurl.com/WikiEditOSU. All are welcome. Hosted by the OSU Libraries in partnership with AfroCROWD. Feb. 8, 2 p.m., Valley Library, Autzen Classroom. NEW! Social Impact Lab: Oregon State University and the United Way of Benton, Lincoln and Linn counties invite you to attend the first Social Impact Lab, a community-wide event that highlights the power of community engagement toward social change. The event will highlight partnerships between community organizations and OSU and provide participants an opportunity to explore and discover other possibilities within our local community. Guest speakers will provide brief TED-style talks about the power of their partnerships and time will be allotted for tabling and networking. Join us on Feb. 13 at CH2M Hill Alumni Center. Doors open 2 p.m. Free, but registration is required. TRIAD: Jim White, professor emeritus in the Department of Chemistry, will present “The Belle Epoque, Marie Curie and Others” on Feb. 7, noon to 1 p.m. in MU 211. The public is welcome to attend free of charge. An optional catered lunch is available for $13. Contact Kathy DeBellis, Kathy.DeBellis@oregonstate.edu to reserve a lunch. TRIAD provides faculty, staff, students and community members with an opportunity to network, discuss events of the day, and learn something new. See triad.oregonstate.edu. From Selma to Moscow: How Human Rights Activists Transformed U.S. Foreign Policy: Sarah B. Snyder traces the influence of human rights activists and advances a new interpretation of U.S. foreign policy in the “long 1960s.” By highlighting the importance of nonstate and lower-level actors, Snyder shows how this activism established the networks and tactics critical to the institutionalization of human rights. A major work of international and transnational history, From Selma to Moscow reshapes our understanding of the role of human rights activism in transforming U.S. foreign policy in the 1960s and 1970s and highlights timely lessons for those seeking to promote a policy agenda resisted by the White House. Snyder is a historian of U.S. foreign relations and an associate professor at American University’s School of International Service. Thursday, Feb. 7, 4 p.m. MU, La Raza, Room 208. Phi Beta Kappa Visiting Scholar lecture with Jamsheed Choksy: Jamshee Choksy will speak on "The Spread of Islam: New Ways of Understanding Conquest and Confessional Change in Iraq, Iran and Central Asia." Choksy is a distinguished professor and chair of Central Eurasian Studies at Indiana University, Bloomington. Choksy’s writings and lectures explore why human existence is often viewed as a struggle between good and evil, and how beliefs and religious practices shape our actions. Thursday, Feb. 7, at 7 p.m., Memorial Union Horizon Room (49). NEW! Wine Gift Basket Raffle: COE-EECS is raffling off two wine gift baskets. Each gift basket will contain a bottle of white/red wine, $10 gift card to Beaver Cheese & Clark Meat Science Center, and more. Tickets are $2, and on sale Feb. 4-13, and can be purchased in Kelley Engineering 1148 during regular office hours. 8 a.m. to 5 p.m. while the office is open. Closed for lunch from noon-1 p.m. For more information contact sherry.barrett@oregonstate.edu. NEW! Baby Photo Contest: Feb. 7-11 at the ILLC Welcome Desk. For more information contact erin.wirkkala@oregonstate.edu. NEW! Soup lunch: Join us at noon Feb. 8 in ALS 3006 for hot soup to warm your soul. Crop and Soil Science Soup Lunch. Come by and enjoy some hot soup. $5 suggested donation. For more information contact emmalie.goodwin@oregonstate.edu. NEW! Panda Express Night Supporting HC Food Drive Looking to eat some delicious orange chicken AND donate to the Linn-Benton Canned Food Drive? If you stop by the Panda Express in the MU on Feb. 8 between 4-9 p.m., pick up some dinner, and mention the fundraiser to the cashier, you can do both - 100 percent of the earnings from this fundraiser (20 percent of sales) will go straight to Linn-Benton Food Share. Soup, Bread and Sweets: , Feb. 7, 11 a.m. to 1 p.m. in 326 Bexell Hall. For questions contact donita.godwin@oregonstate.edu. Chili Competition & Baked Potato Bar Lunch: Come by Cordley 3029 on Feb. 7, 11:30 a.m. to 1:30 p.m. for chili and baked potatoes brought to you by School of Life Sciences. Vote for your favorite chili. Potato & toppings $3; Chili & voting ballot $3; both for $5. For questions, contact durrellt@science.oregonstate.edu. NROTC Thursday Soup Day: Join us each Thursday in the Naval Armory Quarterdeck for delicious soups, desserts and beverages. All monies raised are donated to OSU's 2019 Food Drive. Each week you will have five soups ($4/$7), two desserts ($1) and beverages ($1) to choose from. It comes with a free piece of bread. Feb. 7, 11:30 a.m. to 1 p.m. So stop by and help support the Food Drive! For more information contact lauri.morris@oregonstate.edu. “I think that talented people really do have insecurities, and that is one of the things that kind of motivates them, because that's one thing they know they're good at. And when they're up on that stage, you can do no wrong." ~ Natalie Cole, born today in 1950. Corvallis: Mostly sunny today, high of 40, low of 26. Chance of rain and snow tomorrow with some accumulation possible. Central Oregon: Sunny today, high of 31, low of 14. Mostly sunny tomorrow. Newport: Mostly sunny, high of 41, low of 30. Chance of rain and snow tomorrow.